One can get very comfortable when one has talent in abundance but Bidhan Shrestha had a clear conscience right from the start that working hard is equally important. Maybe it was something that he had learnt from his guru Mr. Amar Gurung himself. Born on 7th of Kartik, 2031 B.S. Bidhan Shrestha has won many hearts with his powerful vocal which can only be credited to his work and dedication he has been putting in everyday till today. His songs carry that unique tinge that can’t be pointed out but you know it when someone has it. 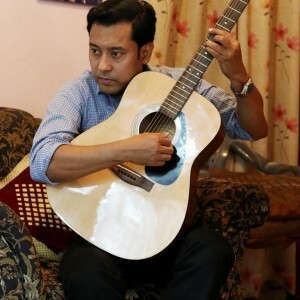 Bidhan Shrestha is back in the limelight with his newest single K garchhau maya. The song has been written by Avay Pandey and the musician is Sunil Saha. You can listen to this song exclusively all throughout the month of Bhadra on Radio Kantipur as he is Coca-Cola Hot Property for this month.